1693 ~ 1697: this disciple of Akita Hikosaburô, who has received the name of Akita Hikoshirô I, performed as a dôkegata in Ôsaka at Iwai Hanshirô I's theater. Fall 1697: Hikoshirô settled in Edo. 3rd lunar month of 1698: Hikoshirô played at the Nakamuraza the role of the servant Kyûroku in the drama "Kantô Koroku". 3rd lunar month of 1699: Hikoshirô's rank in the Edo hyôbanki, dôkegata section, was jô (superior). 11th lunar month of 1700: Hikoshirô played at the Yamamuraza the role of Chôshichi in the kaomise drama "Yorimasa Mannen Goyomi". 1st lunar month of 1701: Hikoshirô played in the same theater the role of Kashiwaya Jinroku in the new year drama "Keisei Mitsu Urokogata". 3rd lunar month of 1701: Hikoshirô's rank in the Edo hyôbanki, dôkegata section, was jô-jô-kichi (superior - superior - excellent). He shared the same rank with Saigoku Hyôgorô I. 1704: Hikoshirô went back to Ôsaka. 11th lunar month of 1709: Hikoshirô played in Kyôto at Kameya Kumenojô's theater the role of Tokuhachi in the kaomise drama "Takekaburi Mangokumochi", which was produced by Takeshima Kôjûrô. 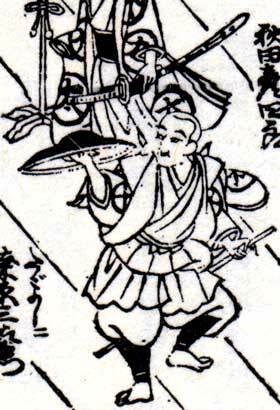 3rd lunar month of 1710: Hikoshirô's rank in the Kyôto hyôbanki, dôkegata section, was jô-jô (superior - superior). He shared the same rank with Yamada Jinpachi. Fall 1710: Hikoshirô went back to Edo. 11th lunar month of 1710: Hikoshirô played at the Ichimuraza the role of Murakami Hikoshirô in the kaomise drama "Shusse Taiheiki", which celebrated the shûmei of Takii Hanshirô and welcomed in Edo the Kamigata actor Kirinami Takie. 3rd lunar month of 1711: Hikoshirô's rank in the Edo hyôbanki, dôkegata section, was back to jô-jô-kichi (superior - superior - excellent). 11th lunar month of 1711: Hikoshirô played at the Ichimuraza the role of the monk Gikanbô in the kaomise drama "Shusse Taiheiki". 1st lunar month of 1712: last-recorded performance of Hikoshirô, at the Ichimuraza where he played the role of Oniô Shinzaemon in the new year drama "Soga Kantan no Makura". No record afterwards. Akita Hikoshirô I was born and trained in Kamigata. He made a fame for himself in Edo as a dôkegata from the end of the 1690s to the beginning of the 1710s. He went back to Ôsaka and Kyôto from 1704 to 1710 but he was less popular than in Edo, as his ranking fell from jô-jô-kichi to jô-jô.